Beauty. Springing forth from the season’s gold and tortoise trend, this exceptional Anne Klein New York Women’s Watch features rich accents that present a deep indulging contrast. The center gold tone links bring a feeling of high fashion that exudes sophistication and glamour. The outer tortoise resin links deliver a dark safari inspired experience that solidifies the watch’s unique character. The interplay between the two creates a romantic contrast and presence that is not soon to be forgotten. The suave and luxurious Butterfly Clasp brings style and functionality to your timepiece. Also referred to as a deployment clasp, the Butterfly Clasp derives its name from its double deployment construction of two wings that open from the center. This clasp is a popular choice because it makes it easier to fasten and remove the watch from the wrist without reducing durability. 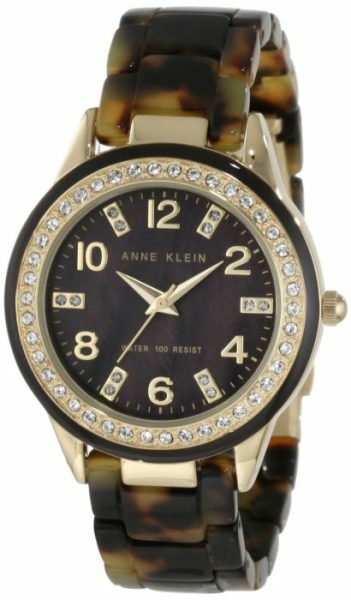 Save on this beautiful watch complete with high quality Swiss quartz movement, adjustable links, scratch-resistant mineral crystal lens, water resistance to 99 feet and Mother of Pearl dial, this Anne Klein New York Women’s Gold Tone Watch is exactly what you’re looking for.